After months of procrastination I finally bit the bullet and placed an order for a lathe. Expensive lathes like a Myford were out of the question so I had spent my time checking the Chinese products in Sydney shops and on the Internet. Tumbler reverse. Left-hand threads are rare but fine feed away from the chuck is very useful. Some small lathes have no provision for reverse feed. Some have an extra gear that can be added to the gear train but this is hardly convenient when traversing back and forward. Some do have the proper tumbler reverse lever (just like the olden days). Top slide travel. Some lathes only had 35mm travel which seems a bit short to me. The degree scale when rotating the top slide is probably not very accurate on most small lathes so using the top slide when machining cylinders is not a good idea but the travel is still needed for cones (unless you're lucky enough to have a taper turning attachment). Cross slide travel. Some have less than half the swing which would make it very difficult to face a large object. The maximum radius that can be worked is limited by the cross slide travel minus say 20mm for tool positioning. Top slide swivel. The Myford ML7 allows only +/- 63° which is a problem sometimes. Some lathes only offer +/- 45° which seems hopeless and CNC would be the only way to solve this restriction. Good pitch range for thread cutting. Catering for a good range of imperial and metric pitches. I know that thread cutting is not a common operation for most people but it sure is nice to have sometimes. Dual prismatic bed to keep carriage and tailstock in alignment. A good flat bed should be okay but a bed with inverted Vees might offer better alignment when worn. Since some (most?) beds aren't hardened this wear might happen sooner than expected. Induction motor. Some lathes use fancy electronics and a brush motor to achieve different speeds. These motors are noisier and probably won't be as reliable as a simple motor. V-belt drive with stepped pulleys for different speeds. Some lathes have spindly little belts (like big O-rings) and some have toothed belts that won't be able to slip if the lathe jams. Some drive a layshaft which has gears (maybe plastic) to drive the spindle. Simple old V-belts seem fine in my limited experience. The option to use a faceplate or 4-jaw chuck is important. Most lathes have a 3-jaw chuck which is easy to use and fairly accurate but a 4-jaw is more versatile. Most lathes have a flanged spindle and some only have three holes in the spindle which means it must be drilled (3 extra holes) to use a 4-jaw unless you also use a backplate. 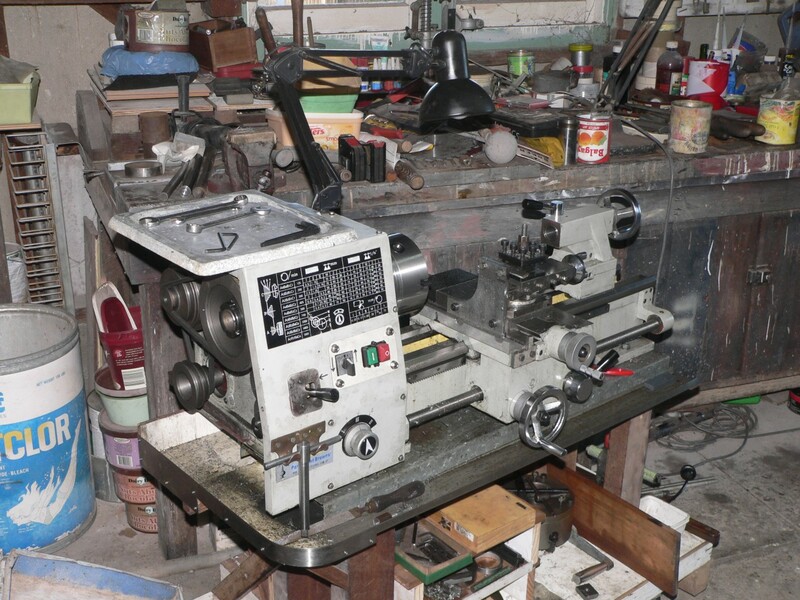 While searching the Internet I found a review written by Rob who bought a lathe in South Australia recently. This review is well written and describes the pros and cons of the machine. The level of detail and pictures convinced me to buy the lathe unseen. Rob's review lists some improvements he has made and I have copied some of his ideas. This report started as a diary because delivery was a comedy of errors and it was so good to finally get the lathe in my garage. The pages now contain details of the lathe and the fixes and changes I have done. The lathe needs a bit of work to fix its shortcomings but this is reasonable given that it is a cheap product from an unknown Chinese manufacturer. It doesn't quite match the advertised product from Haian Machinery or that from Focus-Machine so there is probably at least one other company making the CQ9325 (perhaps ANG International or Weiss Machinery). The CQ9325 covered most of my requirements above and seemed the best around considering my price limit (about $2k) and weight limit (200kg). As you will be able to see from the reports here I have dismantled it extensively and found most of its problems. Yes, it is a bit rough but it is a real lathe and much better than any of the others I had considered. I hope you enjoy my rather critical reports here and find the information useful. All images can be clicked to see a larger version. The lathe now has a chuck key holder on the front panel and a tool tray and light on top of the headstock. The tumbler lever now has a neutral position. The switch panel has been changed. The belt drive door is long gone. There is a tray on the saddle to catch chips and a parting tool holder bolted to the chuck side of the cross slide. Support for this lathe was minimal when I bought it. Paramount Browns was the only seller in Australia and spare parts were not an option. Now it is also being sold by Titan Machinery at Wyong and possibly other retailers. There is a successor model (CQ9325A) but I don't know of any retailers in Australia. Bolton Hardware in California is selling the CQ9325A and has a downloadable manual. The 9325A has power cross-feed (nice) and useful extras like a faceplate and a 4-jaw chuck. The difficulty with searching for this lathe is that retailers have their own name rather than using the original name. Now (2012-06-25) I've sold the lathe to make space in the garage. It hasn't had much use for a while now and hopefully I can do without it. 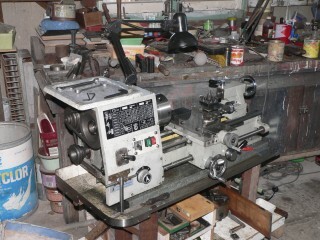 The best thing about the sale is that the lathe has an appreciative owner and I'm sure it will be put to good use. I have not a machinist nor do I have much experience in this area. If you disagree with things here you are probably right. 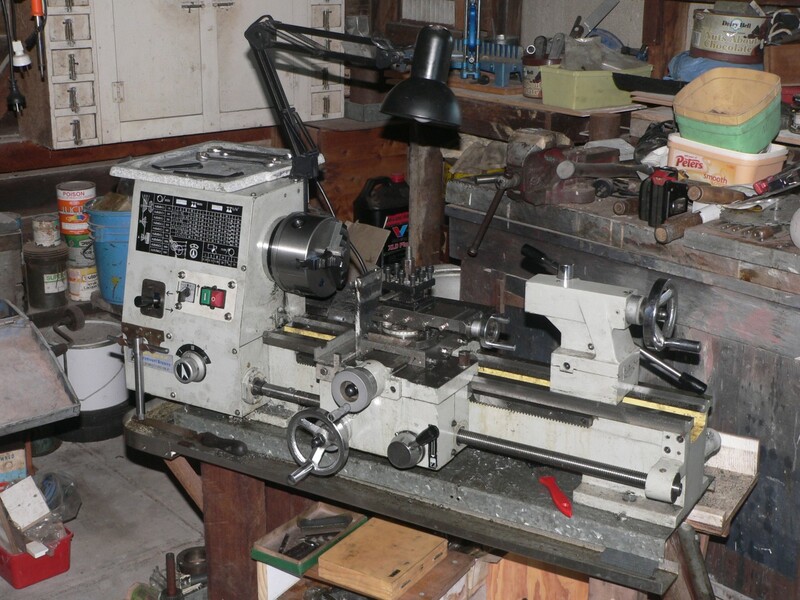 This lathe is a real learning experience for me so I am more inclined to tinker with it than most people would be. Some of the modifications might seem like bush mechanics and again you are probably right. Check my homepage for contact details if you have any questions or feedback. Comments about the content or design of these pages might help me improve this report and will be appreciated. The text size in these pages is variable and specified by your browser settings so you can change it for your viewing convenience.